The ultimate in detail shop lighting! 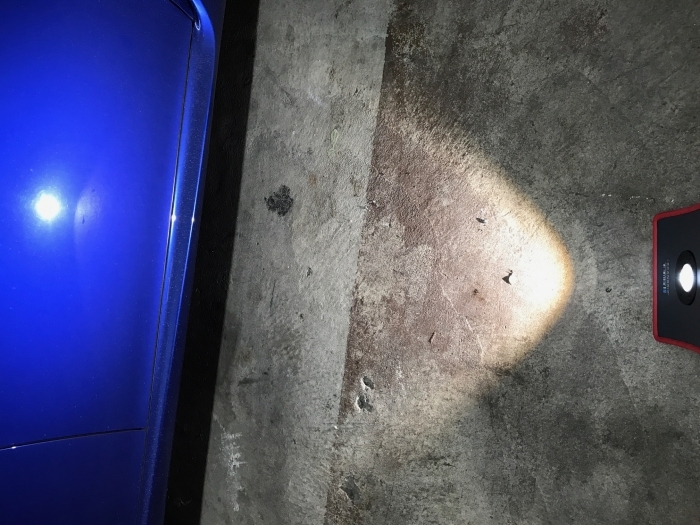 Good lighting is a must in detailing – whether you’re doing it for fun or as a profession, sub-par lighting can cause more problems than not. You wouldn’t believe how easy it is to miss some slight imperfections while detailing, giving you an imperfect finish. Brighten up your work space, and bring those hidden imperfections out of hiding with the SCANGRIP Multimatch. SCANGRIP Multimatch is the largest light available in the SCANGRIP line-up. Generally used for exterior, far away work, SCANGRIP Multimatch can easily be transported inside the vehicle for close-ups on interior work. Two settings allow you to adjust your lighting mode depending on your needs. Easily planted on its own using the built in adjustable base, or combined with the SCANGRIP Tripod, SCANGRIP Multimatch is versatile enough for whatever environment you’re in! 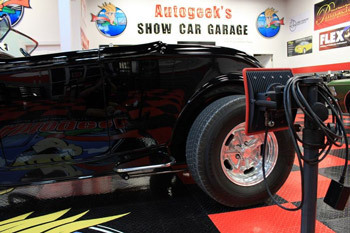 The paint on this black 1932 Ford Roadster looks pretty clean right? 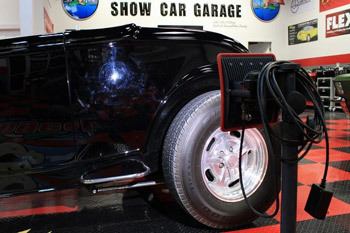 Well as soon as the SCANGRIP Multimmatch light is aimed at the paint (even from 4-5 feet away! ), you can clearly see how much work needs to be performed! SCANGRIP Multimatch is made of a durable die cast aluminum housing that will absorb shock if dropped, and thanks to the curved face, will protect the fragile bulb inside. With a IP rating of 67, SCANGRIP Multimatch is dust and waterproof and is overall an extremely sturdy work light. With a rechargeable lithium ion battery, SCANGRIP Multimatch has a 6 hour working time and only a 3 hour charging time. No time to wait on a full charge? No matter! If you’re within 16 feet of an outlet, simply plug your SCANGRIP Multimatch in and continue right on working! For ultimate versatility, check out the SCANGRIP Multimatch Tripod Single – it pairs this powerful light with the SCANGRIP Tripod for an increased lighted work area. You’ll never have to worry about bad lighting again! This light is so amazing, its perfect for detailing. You can can set it on the ground and adjust angles and it stays sturdy. Very well built, it shows defects like no tomorrow. Your not carrying anything big or holding anything heavy, it just sits while you work and you can move it very easily. You might think one light isn't strong, however dont under estimate the power of this. Anyone whose detailing should use this. It comes very handy for paint correct, detailing at night, detailing interiors, not to mention lighting up the whole household. ProsVery useful light source, strong/powerful, no heat, easy to carry, lightweight, well made, good balance for any detailer needing light. ConsNone, maybe the price, but if you buy your own light set from lowes/home depot your probably going to end up spending $200+ for a nice setup. If AG has a sale, this item is a must buy.